Fibromyalgia, that affects millions worldwide, still lacks awareness. This leads to fibromyalgia patients, rightly called as fibromyalgia warriors, fighting not just the illness but also the ignorance and indifference. The lack of awareness is adversely impacting the lives of patients worldwide, especially in countries like India where most people have not even heard the name of the invisible illness! If you are a warrior or caretaker, you know what we mean. If you are a blogger there's so much power in your hands to do your bit in raising awareness. So we invite you to write a guest blog post on our blog www.fibromyalgiaawareness.com. Talk about the illness or how it impacts your everyday life or your personal tips or the need for awareness or being a caretaker. No product promotions please. We'll publish your post on the blog and ensure it gets enough visibility by sharing it in our Facebook Page, Twitter Page and our Google Plus Page. You can also share it on social media / email to your friends so that more and more people learn about it. 1. Keep it original, do not copy-paste things from elsewhere. 2. SHARE the posts submitted by others too and they will be doing the same so that together we all will help our efforts be seen. 3. Use the hashtag #FibromyalgiaAwarenessBlog while sharing it online. 4. Try to write in less than 500 words. So what are you waiting for? 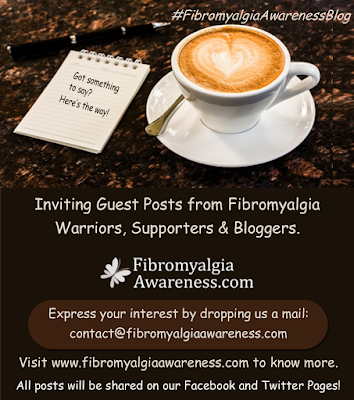 Simply send us your post on contact@fibromyalgiaawareness.com by 30th June 2015.